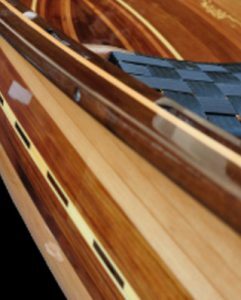 Canoes - Orca Canoes and Kayaks Ltd.
Orca Boats builds wooden canoes in almost any design including classics like the “Prospector“, “Bob’s Special“, and the “Huron“. Using existing designs, we can also modify plans to custom build a wooden canoe tailored to your specific needs, paddling abilities and skills. We also build wooden canoes as display models for individuals and businesses. We do not, however, design or sell plans for canoes as there are many established and proven designs available. Contact Us or go to the Custom Boat Builder’s page to find out more about our prices for functional and display products or if you would like assistance choosing the right model for you. I build wooden canoes in almost any design including classics like the “Prospector”, “Bob’s Special”, and the “Huron”. Using existing designs, I can also modify plans to custom build a wooden canoe tailored to your specific needs, paddling abilities and skills. For more information on all the canoe options, contact me, and I will assist you with your choices. For pricing, please browse the pricing page or inquire via E-Mail. I also build wooden canoes and kayaks as display models for individuals and businesses.